This tangle, as the name indicates, uses orbs within an X. I am addicted to orbs and how to use them on a tile. I researched the name and did not find any tangles with this name. Please let me know if this name is already taken and by whom so I can aplogize and rename this pattern. Tangles in the colored tile: Antidots (by CZT® Anita Roby-Lavery), Tangleation of Snail (Zentangle®-original by Rick Roberts and Maria Thomas), Arnia, Xs and Orbs, Orb Pods, Clusters (by CZT® Maureen Stott. Step-outs for these last four tangles are on this website). 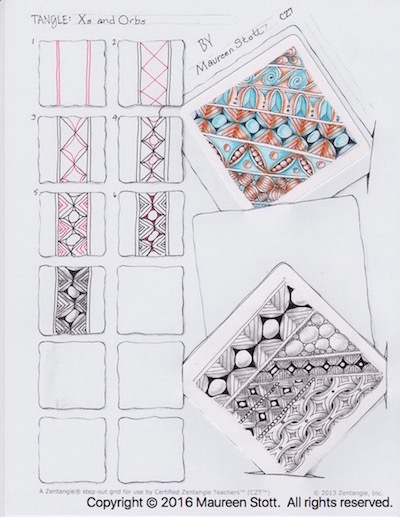 In the black and white tile: Tipple (Zentangle®-original by Rick Roberts and Maria Thomas) and MI2 (by CZT® Mimi Lempart) and variations of Xs and Orbs.